Godzilla: A Quick History / Site Explanation - Story Forward. A brief look behind this clasic monster, and some words about the site and it's story. Godzilla hit America in 1956...like several hundread tons of brick! This, in itself was a landmark...As ''Godzilla: King of the Monsters" was pretty much, the first full length movie imported from Japan. ( Of course, we saw all new scenes with Raymond Burr skillfully spliced into the original ) Here in the U.S, the movie had been intended to be another Drive-in "B" film that no one would pay too much attention too. Unexpectedly, it would spark off a craze that is still strong to this day, almost 50 years later! The film was shot under the direction of Ishiro Honda. The effects were handeled by Eiji Tsuburaya, using an actor in a rubber suit for the monster. With the film in Black and white, and most of the monster scenes shot 'at night', The creature was very convincing. Tradmark was not only the monster's design, but also it's voice. The unique roar is actually produced by rubbing a rubber coverd leather glove over a contrabass, then mixxed in a sound studio... This had been the brainchild of Akira Ifukube, who was also responsable for most of Godzilla's scores. After the first film was well received, others were made, and imported, going through it's hayday in the '60's with one of the most popular films in the series..."Godzilla vs. King Kong. " East meets west in spectacular fashion. 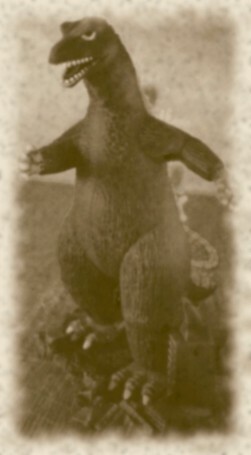 But, by the '70's, Godzilla became campy, designed to target the kids. The beast was now the good guy...and the films were shot fast. Then, things went quiet for abit...Until 1984/85. Godzilla was back! Meaner, larger and more destructive then ever. The late 80's/ 90's Godzilla was a monster to be delt with! A massive, natural disaster to be treated as such! 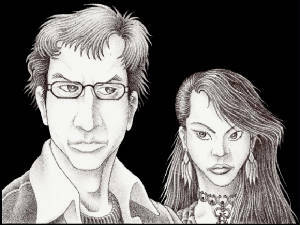 Above, an early drawing of the story's basic elements. Ok, I know what you're thinking... Why are you going to do, yet another Godzilla fan site? Aren't there enough on the web? Well, yes... 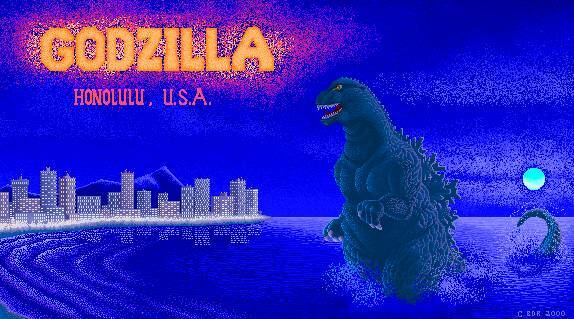 There are plenty of Godzilla sites on the internet. Most are posted by avid fans. That said, I'm one of those long time fans. ( I learned about the giant reptile around age seven... Long before I was even aware of the Yamato / Argo.) 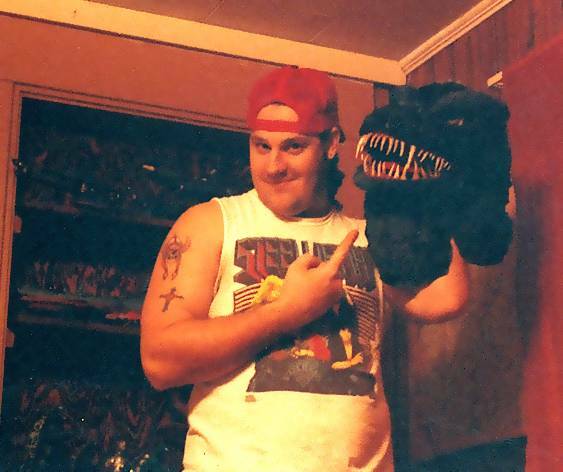 Basically, I've been a Godzilla fan... Long before it was 'Cool' to be a Godzilla fan! 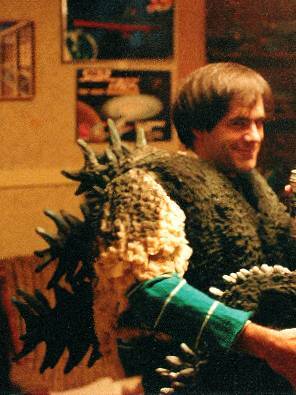 In 1991, I even built a full sized 'Heinsei' styled Godzilla suit for Halloween... It came in at 45 odd pounds! This site will be built around an original story... Written by myself. As an artist, It started with drawings... Back in 1989! So, the story's been tossed, beaten, blended and stired for many, many years. The idea sprang from a failed attempt at bringing Godzilla to Hawaii. This idea never got that far... It was the original intent for 'Gigantis, the fire monster'. So, I have a well revised story... And, as with the E.D.F. Drawingboard, there will be alot of original artwork to keep it company. That said, This site will offer a new flavor to 'Godzilla', much as the 'Drawingboard' brought a new feel to 'Yamato / Starblazers'. Yes, my reptile will be original... But, it won't be an oversized Iguana. 'Godzilla: Terror in the Pacific' will deliver this new monster to Honolulu, among other island landmarks... And there will be plenty of action. But, a warning to all who expect the usual 'slam-bang from beginning to end' format... This new story offers plenty of character development, and heart as well. I personally feel that the best films, start by sucking you up in the characters... and the dilemma's they end up in. Along with the character's story, there will be plenty of science fiction theory to explain it all. Still here?? Good. Then sit back in front of your computer, put on some music, grab the refreshment of your choice...and take a ride with Max Harrison... ( Think, Jeff Goldblum.) As he's plunged into an event he does not understand, nor believe. Submitted for your aproval, Godzilla: Terror in the Pacific. Godzilla is Trademarked and Copywritten by TOHO Industries. Japan. This site is intended to pay tribute, thereof. So please, if you're looking at this site from Japan, I mean no offence, or mallace... Only a bit of Fan contribution!